I was back in Big Sky, Montana recently. It’s one of my favorite resorts because I love the slopes and (shh!) there are never any liftlines. They’re in the midst of a multi-year, multi-million dollar project performing upgrades all over the mountain. This year saw the addition of North America’s first 8-seat chairlift (complete with a bubble and heated seats!) and in coming years the ancient beginner lift will be replaced with a gondola that will service both beginner slopes as well as bowl skiing for advanced skiers. 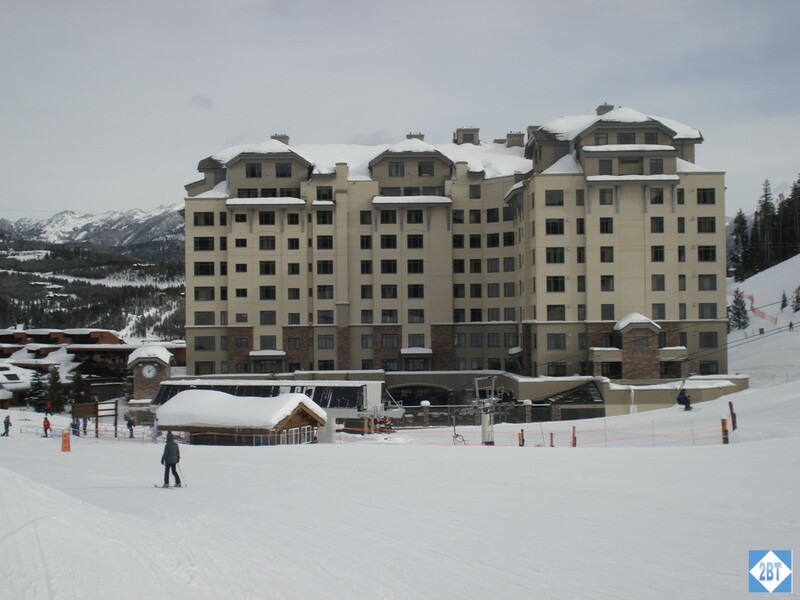 In the recent past our ski club has stayed at The Summit, which is a high-rise condo right at the base of the slopes. But two years ago the property began the process of upgrading from a 4-star property to a 5-star. Though it’s only a 4.5-star at the moment, that was enough to push the pricing out of our club’s budget. I really hate that because it’s so convenient and has the best hot tub on the mountain. So this year our club stayed at the original base lodging facility, The Huntley Lodge. Named after resort co-founder Chet Huntley (he of NBC News fame from the 1960s & 1970s; look it up, kids) it’s a 3-story hotel with half the rooms facing the slopes. Rooms in one wing are mere steps from the beginner Explorer lift while rooms in the other have the mountain village right outside the door at the end of the hall. For convenience, it’s really hard to beat. While I have stayed here before, it had been at least 20 years so I was curious to see what had changed. The answer: not a whole lot, which is actually a good thing for the most part. 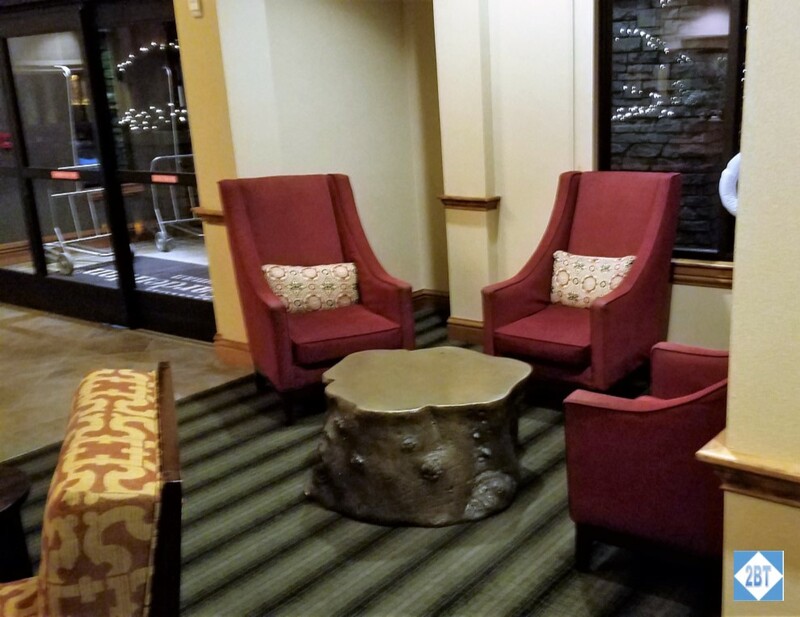 The lobby is not huge but has a fair amount of seating and, like all the common areas, has a mountain theme to the decor. I especially liked the old skiing items mounted up high. The dominating feature is The Bear. If you ever need a meeting point, it’s a great landmark. As I’ve done for the last couple of years, I flew out on a Friday for my ski trip even though the group wouldn’t arrive until Saturday. I do this because I’m in a different origin city and I want to be sure I’m not late catching the bus from the airport to the ski resort. If all my flights are on time it works out fine but at some airports I just can’t arrive before the group due to flight schedules. And with so many credit cards offering free nights I can usually spend one of those certificates although that’s not what I did in this case. I looked into using my IHG free night but by the time I got around to booking a room, the Holiday Inn Express had no more availability. 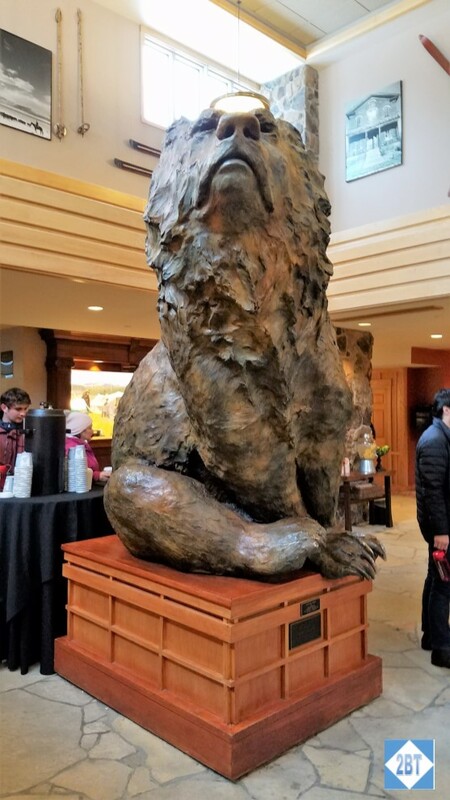 This year my first ski trip was to Big Sky, Montana, one of my favorite resorts. I believe my first visit was in 1994 and I’ve returned every 3 or so years since. On my club’s last trip here I flew up on a Friday and spent the night at the Residence Inn in Bozeman and that was when I learned they no longer had a hotel shuttle. So instead of burning my Marriott certificate here I thought I’d try out my newly minted Diamond status with a Hilton property. I was fortunate that the cabin crew from my flight was also staying at the Hilton Garden Inn because by the time I’d collected my luggage (and kudos to the BZN baggage crew for making priority bags first on the belt!) and called the hotel, the cabin crew had called the hotel, the shuttle had arrived and they were already on board so I didn’t have to wait for the shuttle at all. Since I had so much luggage to wrangle I let the flight crew check in first while I got all my bags inside. 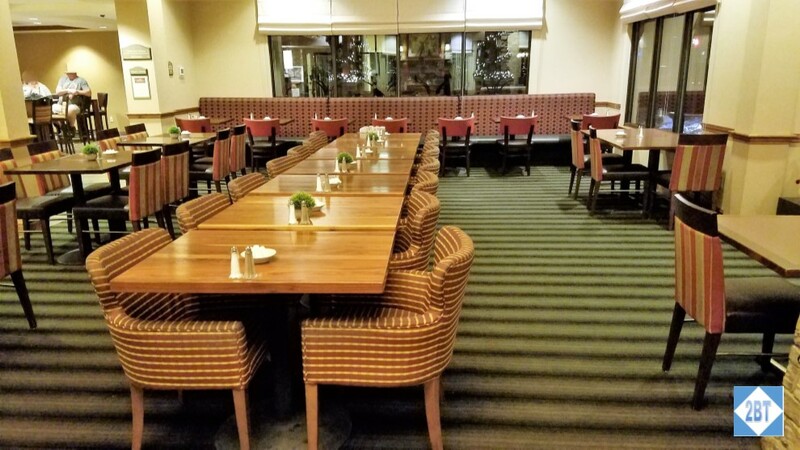 The lobby has a large seating area for breakfast on the right side and more casual seating on the left side though there’s a long table there that could be used for breakfast too. I love to ski and went on two trips this past ski season. The first one was to Big Sky, Montana, which is one of my very favorite places. 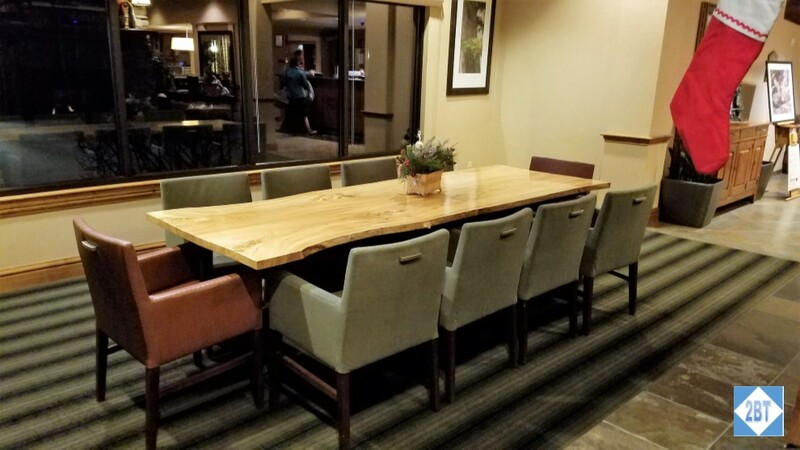 It’s a little remote – the closest major airport is Bozeman (BZN), which is about 90 minutes away – but being a little hard to get to means it’s not crowded. And by “not crowded” I mean that if there are two groups of people in front of you in a lift line, that is a lot. They define a “busy day” as one with more than two people per skiable acre. As someone who is not overly fond of crowds, this is just fantastic for me. 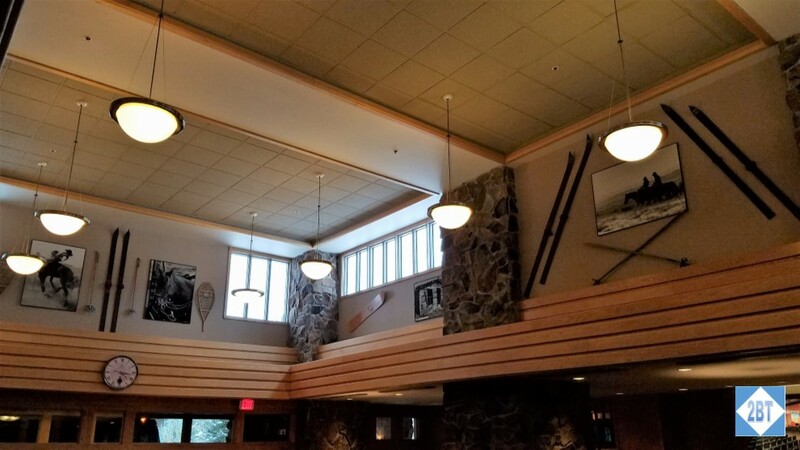 My first trip to this resort was in 1994 and I’ve stayed in four different accommodations over the years since our ski club visits every 2-3 years. By far the best choice is The Summit.